Front of the recipe card for Spanish Eggplant. Fortunately, the nibbles the mice left behind didn’t damage the card too much so we can still see what is typed on the recipe card for the ingredients and instructions. 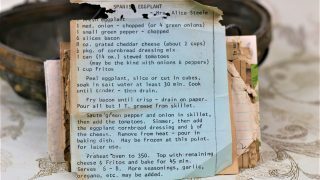 There is a notation that this recipe is from Alice Steele. There are lots of fun recipes to read in the box this recipe for Spanish Eggplant was with. Use the links below to view other recipes similar to this Spanish Eggplant recipe. 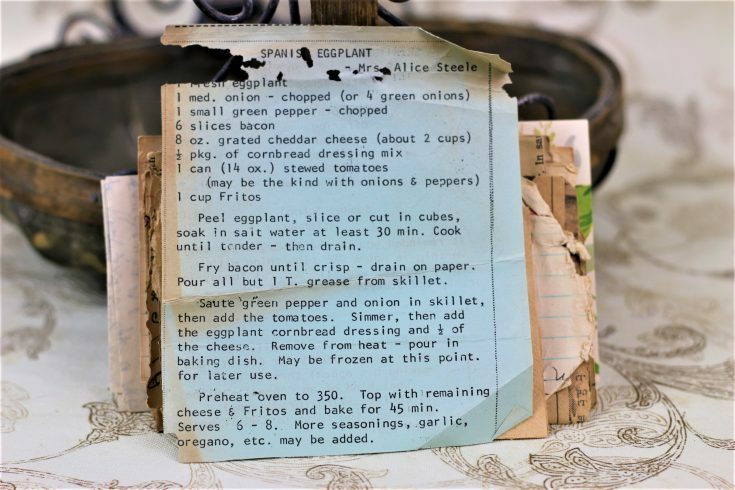 If you make this Spanish Eggplant recipe, please share your photos and comments below! Peel eggplant, slice or cut in cubes, soak in salt water at least 30 min. Cook until tender - then drain. Fry bacon until crisp - drain on paper. Pour all but 1 T. grease from skillet. Saute green pepper and onion in skillet, then add the tomatoes. Simmer, then add the eggplant cornbread dressing and ½ of the cheese. Remove from heat - pour in baking dish. May be frozen at this point for later use. Top with remaining cheese & Fritos and bake for 45 minutes. More seasonings, garlic, oregano, etc. may be added.